Everybody needs a little quiet time to him/herself, and birds are no exception. Can’t get over how hard this Wood Stork above was working all morning, flying out and back, out and back to the trees every few minutes, searching for just the right soft cypress branches to bring back to the nest. He could use a break! This Mottled Duck mom is also committed to her domestic duties. 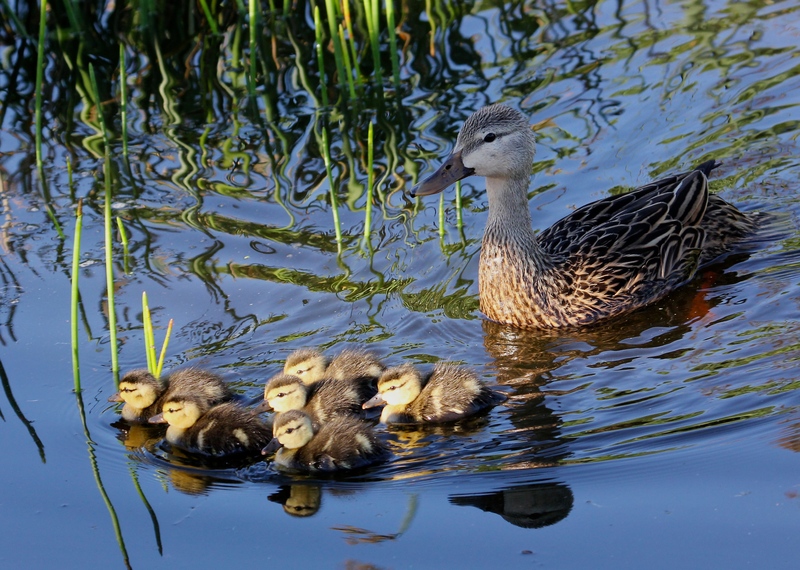 Her little ones hatched just last week, and they’re already off and running – all over the pond. Watching her swim around, chasing after the whole crew, reminded me of the expression “It was like herding cats”. 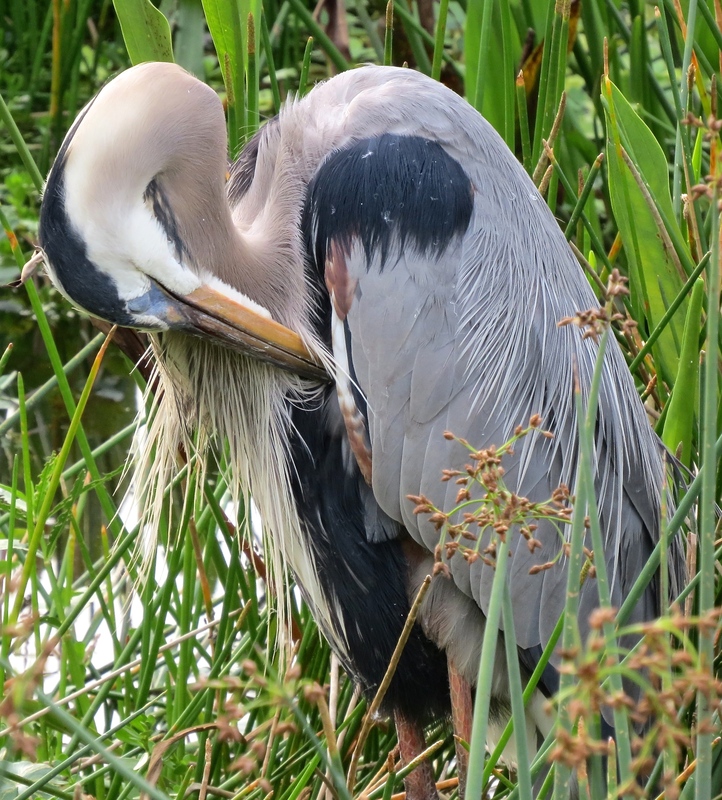 Some parents, like this Great Blue, are probably exhausted from the nesting season, so he’s taking a well-deserved break off away from the rookery. The GBH juveniles have been heading off on their own of late, as they’ve gotten quite large and independent. 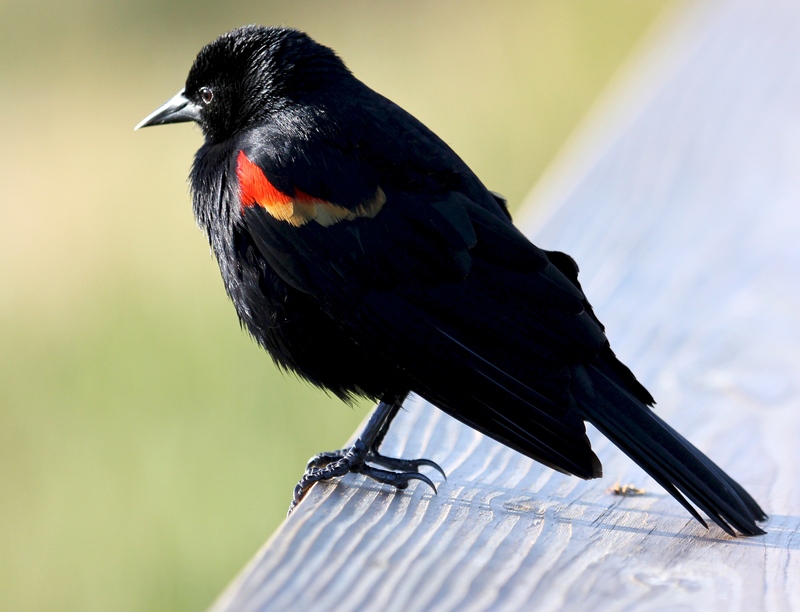 The Red-winged Blackbirds have been amazingly active this nesting season, and I saw two RWBB nests almost within arm’s reach of the boardwalk yesterday morning! Soon, we should be seeing lots of little ones, so this guy probably also needs a little “alone” time right now. 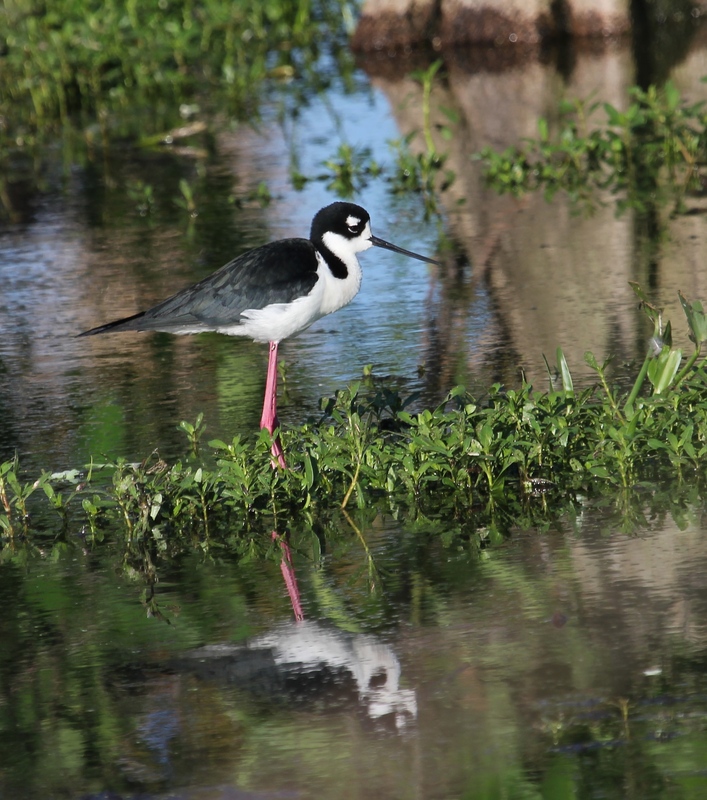 The Black-necked Stilts haven’t been here long, and, though they are very busy flying back and forth, I haven’t seen where their nesting areas are yet. This one looks like he is on a reconnaissance mission away from the fray, scoping out a nice private spot. This entry was posted in Birds and tagged Black-necked Stilt, Great Blue Heron, Mottled Duck, Red-winged Blackbird, Wood Stork. Bookmark the permalink. Glad you enjoyed them, Amy. Thanks!! Lovely shots and excellent descriptions. My favorite is the teal hen and chicks. Looking forward to your next post from this rich and rewarding wetland! You are so right, Nick – this truly is a rich and rewarding wetland preserve! Funny thing about the mother duck …..a local birder confirmed this is a Mottled duck, not a Teal, b/c she said Teals don’t breed here. They look so similar that I’d checked for confirmation;). But I only made the correction in one place on my post, and left the other caption as Blue-winged Teal! Oops – I’ll fix that. I love this time of year when the baby ducks are hatched. Mom does look very proud. Thanks for stopping by and visiting, Pat! Hope you’re enjoying a beautiful day! What an avian playground you have down there, and photographers get to play too. Wow you are seeing many cool birds! Stilts?! Outstanding! I’m hoping we get some wood storks in soon, I miss those big guys. We are also entering into baby ducky season here. Although, even though Mrs. Duck may start out with a dozen, between the snapping turtles and hawks she is lucky to end up keeping 2 or 3. I know what you mean about the ducklings….we’ll all be watching to see how many survive as the weeks go by. I occasionally go to other sites, but this spring, nothing beats the local wetlands 3 miles from my house! We are amazingly fortunate to see the variety of birds and other wildlife that we do – all year round. Always nice to have you stop by! I really enjoyed this post – lovely pictures and thoughts.